Our elegant and stylish Sovereign Wooden Box provides safe and accessible storage for your treasured gold Sovereign coins. Each section is made from high-quality wood that has been finished with a coat of varnish to give a subtle, silky sheen. The two sections are hinged to provide easy access to your Sovereign and the lid also ensures that your valuable collector's coin is fully protected from moisture or dust. 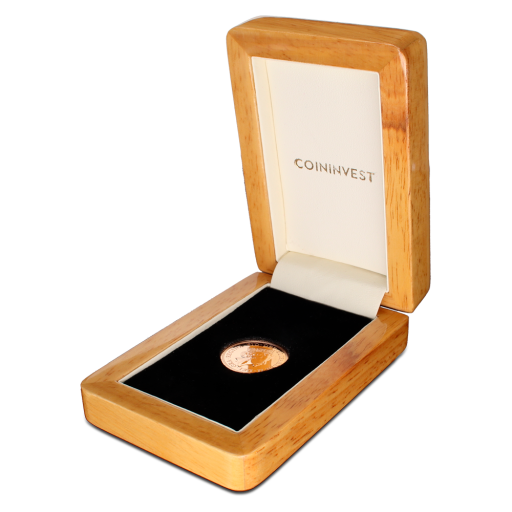 The Sovereign Wooden Box features a white silk inner lining on the top section with the word COININVEST in shimmering gold. The base is lined with cushioned black velvet material that contrasts beautifully with your fine gold Sovereign while the coin recess is precisely cut to offer a snug and secure setting. 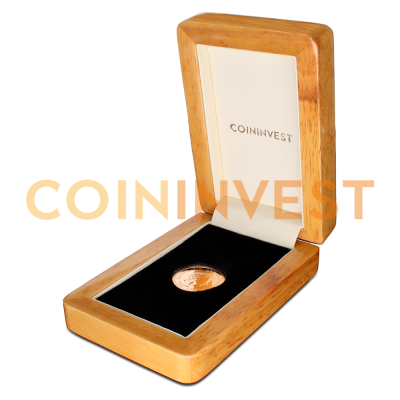 Be sure to add your Sovereign Wooden Box to your next order at coininvest.com.